Dr Wiles won the Callaghan Medal for science communication, for her vital contribution to raising public awareness of the value of medical science to human health and wellbeing worldwide. In the past year, she has also won the Prime Minister’s Science Media Communication Prize and the New Zealand Association of Scientists Science Communicators Award. Dr Wiles is a microbiologist who uses bioluminescence (the production of light by living organisms) to study infectious diseases. Her research group creates glow-in-the-dark bacteria in order to better understand how to prevent and fight diseases such as tuberculosis and hospital superbugs. She frequently comments in the media, is a prolific blogger, and was a face of the public engagement campaign for the National Science Challenges. She uses innovative ways to communicate science to the wider public, from producing popular animations to collaborating with an artist to produce an installation as part of the recent Art in the Dark exhibition in Auckland. The Callaghan Medal is awarded annually to a person who has, while in New Zealand, made an outstanding contribution to science communication, in particular raising public awareness of the value of science to human progress. 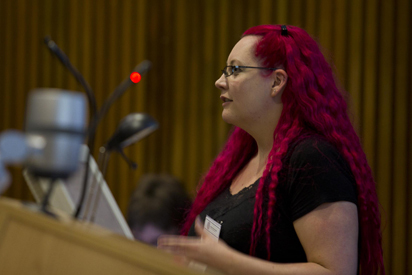 Image: Dr Wiles speaks to Maurice Wilkins Centre affiliate investigators at the Centre's 2011 Future Science Day.